9to5Mac is reporting that Apple will likely be updating nearly all of their Mac products at next week’s World Wide Developers Conference (sounds familiar). The report claims that “at least four” of Apple’s five Mac products will see an update. The machines most likely to receive updates are the MacBook Pro, MacBook Air, and iMac, as suitable processors were just released from Intel. The report also claims that the MacBook Pro and Air will receive ultra-high resolution “Retina” displays (as has been rumored for some time). It remains uncertain as to whether the iMac, with it’s much larger screen, will also receive the “Retina” treatment. From there, 9to5Mac claims that the Mac mini is the more likely to receive an update over the Mac Pro, seeing as how Xeon E5 processor suitable for the Pro have been out for some time now, and there still hasn’t been an update. Lastly, the report claims that Apple may very well use this massive refresh as an opportunity to introduce refreshed accessories as well. Details are scarce on this front though. Now, to begin popping holes in this report. 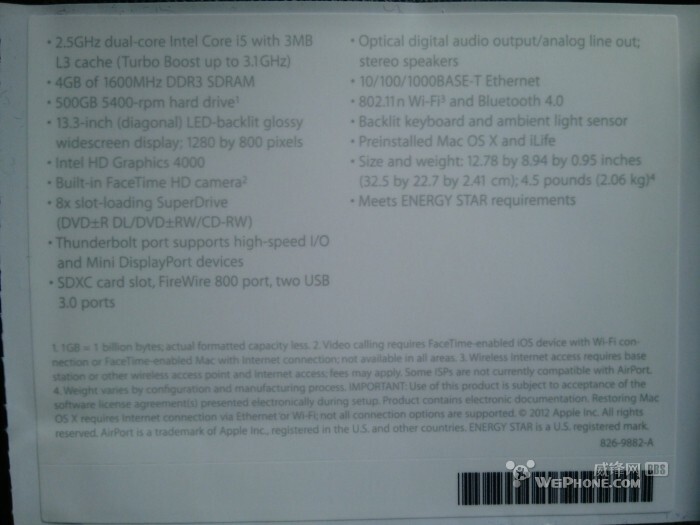 Chinese forum Weiphone is playing host to a photo post which shows off the new specs for the 13.3-inch MacBook Pro. It seems that there will only be minor improvements in the form of a 2.5GHz Ive Bridge processor and Intel HD Graphics 4000 GPU, Bluetooth 4.0 and USB 3.0. Nothing too surprising here. This forum post’s credibility takes a hit, when the original author edited the post and added additional system specs for the forthcoming 15-inch MacBook Pro refresh. The specs listed here outline a previous generation processor, and not the new Ivy Bridge processors that will most certainly be used in the new 15-inch model. Finally, MacRumors reported earlier that Apple is actively pulling existing stock of Mac Pros from their retail stores. Availability had been spotty for some time, but it seems that Apple is stopping shipments ahead of a impending refresh. Following that, 9to5Mac reports that the Mac Pro will indeed be seeing a refresh in the near future. They note that pricing will be similar to current Mac Pro models, which will come in three configurations: two standard versions and a third server model. This update will come nearly two years after the previous Mac Pro refresh. So, expect new Macs to be announced this Monday, June 11th at the keynote kicking off Apple’s World Wide Developers Conference. If I had to guess, Apple will refresh all of their Macs at this time. Stay tuned to iSource for up-to-date coverage. * I still think it’s only a matter of time before the MacBook Pro line becomes more like the MacBook Air line. Why Why Why did Apple settle with awful integrated graphics!? Arghhhh! I have to wait another generation for Nvidia or AMD level graphics? ?